Chhattisgarh is a landlocked state located in Central India. Today, the state is mostly known for thick jungles, a rich tribal culture, and unfortunately, the violent Maoist conflict as well as extreme poverty. However, very few people know the modern-day state of Chhattisgarh has a rich and ancient history of almost 10000 years, although the state itself was only created in 2001. Ancient Period- Chhattisgarh has several ancient sites along the river Kharun. The most notable of these is the site of Tairghat in the Durg district, which likely thrived from 1000 to 200 BC. Along with organized planning, archeologists have unearthed ancient figurines, beads, and pottery. Ancient City of Tairghat, Durg district Chhattisgarh. Circa 1000 BC. Notice the design and planning of the ancient city. Ancient beads found at Taighart. Some of these are believed to be from even older periods. 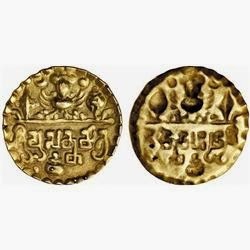 Gold Coins of the Satacahan dynasty. 2500 year old elephant figurine. Some archeologists believe the people of Ancient Chhattisgarh had contact with the peoples of Southern Africa. Did they have contact with South Americans too. The original inhabitants seem to be quite similar. When discussing history, kindly do not mention aliens alighting from Mars and such wild contact theories. Perhaps we all have contact with Africa. Modern humans are thought to have originated there. For God's sake, the OP is talking about 2500 BCE not 60000 BCE. The alien theory is as sound as your Arctic Aryan theory. He said 'alien-like figures'. I would like to know what 'aliens' look like? ET? Or something stranger? Sure, Alien theory is like Arctic homes, they are mentioned in RigVeda. Gandharvas et. all. Only that a whole lot of people have lived and still live in Arctic regions. Norilsk, Severmorsk, Russia and Tromso, Norway are 69 degrees North. Murmansk is 68.6 degrees North. "The midnight sun occurs from about 18 May to 26 July, ... Owing to Tromsø's high latitude, twilight is long, meaning there is no real darkness between late April and mid-August. The sun remains below the horizon during the polar night from about 26 November to 15 January, .. the sun is not visible from 21 November to 21 January. The return of the sun is an occasion for celebration (Aryan New Year). However, because of the twilight, there is some daylight for a couple of hours even around midwinter, often with bluish light. The nights shorten quickly. By 21 February the sun is above the horizon from 7:45 am to 4:10 pm, ..."
"Ati-Ratra" for a month and 20 days. Usha and Sandhya 20 days each. Sun visible for nine months (Navagwahas). Is RigVeda description very different from this? Remember, pre-glacial Arctic was much greener. "The change to glacial conditions at the onset of the Younger Dryas (Aup. : last cold period) in the higher latitudes of the Northern Hemisphere, between 12,900–11,500 calendar years BP, has been argued to have been quite abrupt. It is in sharp contrast to the warming of the preceding Older Dryas interstadial. It has been inferred that its end occurred over a period of a decade or so, but the onset may have even been faster." Kindly, do not bring Arctic discussion in Chhattisgarh topic. Nothing can be more irrational than citing human migration from Africa 60000 years ago while someone is discussing elephant figurine of 2500 BCE. Hello, @Aupmanyav sorry for the late reply, I have had a lot going on lately and I have been away from this forum. Yes I understand your concerns, and perhaps that was not the most appropriate thing to include in a history thread. But the reason those cave paintings became famous was because of their striking resemblance to beings that can resemble our current imaginings of extraterrestrials, so I felt I should mention that in the thread. I believe NASA along with ISRO did an investigation into it, but I do not know what came out of it. As for contacts with South America, I doubt it simply because of the distance. But you are right, the ancient civilizations of the Americas(mainly the Aztecs, Incas, and Mayas) share a striking resemblance to the civilizations of the old world(pyramids are a good example of this). That is just proof of the fact that despite belonging to cultures and civilizations on opposite ends of the world, humans think similarly and the evolutions of their civilizations reflect this. The only difference is the amount of time it takes for different civilizations to evolve. CHHATTISGARH, INDIA—A figurine resembling an African Elephant has been unearthed at the Tarighat site in Central India. “The elephant has large Ears and Spine bones visible on its back, identical to Elephants found in Africa. Elephants of that physique can’t be found in Asia,” JR Bhagat, Director of the excavation for the state Archaeology Department, The 2,500-year-old site[ Not 2500 BC ] is probably known as an International Trading Center where "Scythian and Greek Coins" have been found. Earlier excavations have also uncovered "Figurines of a Giraffe-like animal" ! Ashok Tiwari, a former curator at the Museum of Man, Bhopal, thinks that the figurine could have been Sculpted by a local trader who had traveled to Africa.. Archaeologist CL Raikwar added that similar pieces of “Country Art” are the result of artists’ imaginations. “Chhattisgarh might have had an affluent and glorious past but I am yet to find clearer links of Tarighat to the international market,” Bhagat concluded !! Can we do a DNA test on a clay figurine? You sure, it was an African elephant?